Insoluble oils lighter than water can be easily separated in a settling tank with an adjustable skimming weir. These oils readily float to the surface, and the depth of the weir is adjusted according to the amount of oil in the water. FIG. 7.43.1 Combined soluble and insoluble oil removal. FIG. 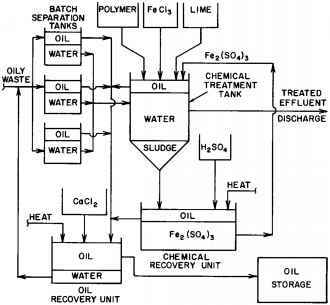 7.43.2 Oily waste treatment system that uses chemical reuse and oil recovery. 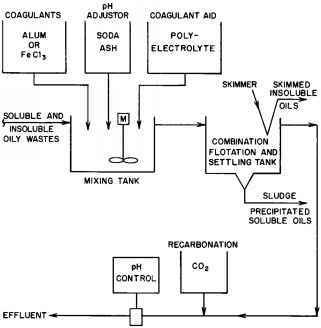 Insoluble oils heavier than water can be recovered in a settling basin with a bottom sludge separator. The withdrawal rate of the sludge from the bottom must be proportional to the amount of heavy oil separated from these liquids. All coagulation techniques use the settling princi ple; the oil is rendered insoluble and heavier than the water so that it can be removed by settling with sludge removal. For coagulated solids, wastewater treatment facilities use filtration through various media. Sand provides a satisfactory filter medium, but diatomaceous earth is more commonly used due to the disposability of the diatoma-ceous earth filter cake. Continuous centrifuging also separates oils from water, but this technique is expensive. Also, for varying densities and volumes of oil in waste, wastewater treatment facilities must continuously adjust the centrifuge system. Dispersed air flotation is also effective in separating oil from water. 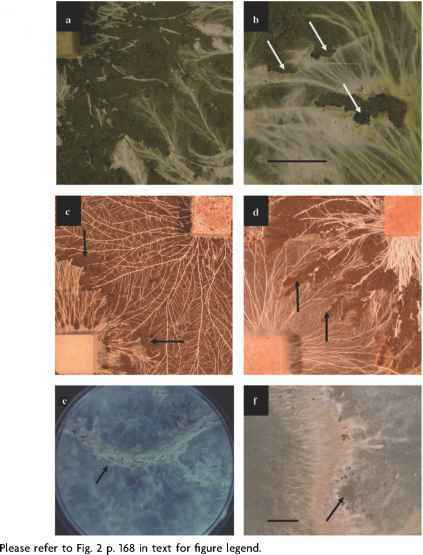 This technique has been practiced with and without prior chemical coagulation. Sometimes breaking down the foam after it has carried the oil from the water is difficult. Dispersants can break down the foam so that the oil can be properly disposed of.